Some people dive into a new destination through monuments and museums — I do it through the food. 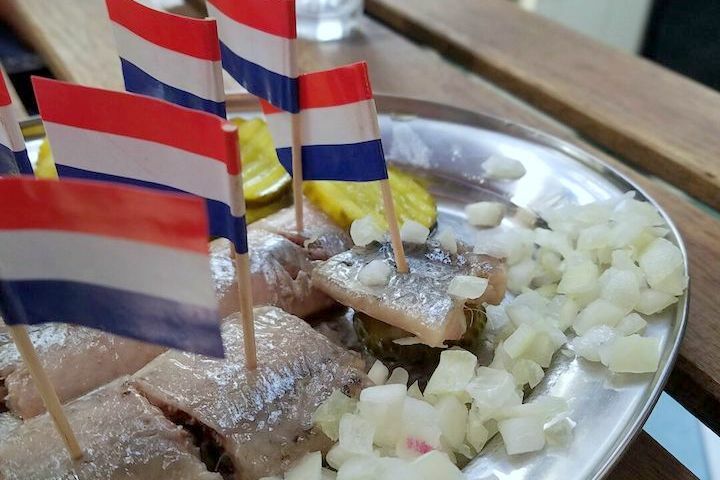 My goal is to connect with the local culture and cuisine, which usually means market visits, food tours, and hidden away restaurants are involved. On my recent foodie trip to Paris, I hit the streets in search of the top 12 must try foods in Paris. Read on for my absolute musts — worth every bite! 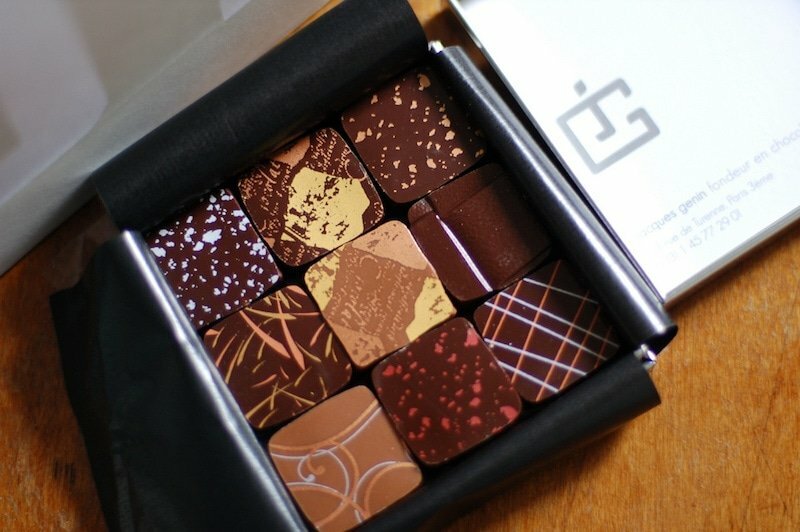 Delicious gourmet chocolates in Paris. Photo by Dana McMahan on flickr CC. Paris always intimidated me. 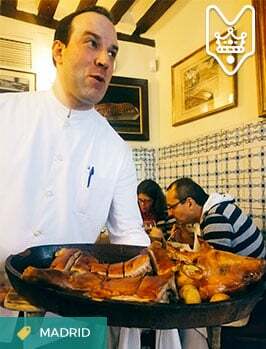 Its long culinary history, top chefs, and pricey reputation had me delaying our trip for years. But finally, I had to take the plunge and bought tickets for a long weekend in Paris to visit my childhood friend, Lee. Would it live up to my high expectations? Paris is a food lover’s dream come true, but you can’t rush this city. If you can’t spend a few weeks (or months) eating your way through Paris, I recommend taking it in chunks and not stressing about cramming it all into one trip. Now that I’ve been, I know I’ll be back time and time again. ***EXCITING NEWS! 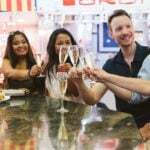 *** If you’d like to Devour Paris on a guided food tour, award-winning Devour Tours is launching in Paris in spring 2019! Sign up here to be the first to know when tour signups open (and take advantage of special early bird tickets!). We arrived in Paris early on a Friday morning and were staying in picturesque Montmartre. We had until Monday afternoon to eat our way through Paris’s cafés, pastry shops, markets, and bistros. Since it was our first visit, we were looking to taste classic Paris — the best baguettes, eclairs, macarons… So we didn’t have the chance to visit many restaurants (next time! ), though we did have a great meal at Le Richer. Paris is a food lover’s dream come true! If you go to Paris, here’s what you cannot miss! Oh, the humble baguette. What a beautiful piece of French culture! This long loaf of bread has been made in France for centuries, yet the word itself is said to have only been used since 1920. 100 years later it is still going strong, and we saw plenty of locals piling into their neighborhood boulangerie to collect a warm loaf. Wondering where to try a good baguette in Paris? Luckily, this is a city that loves awards. 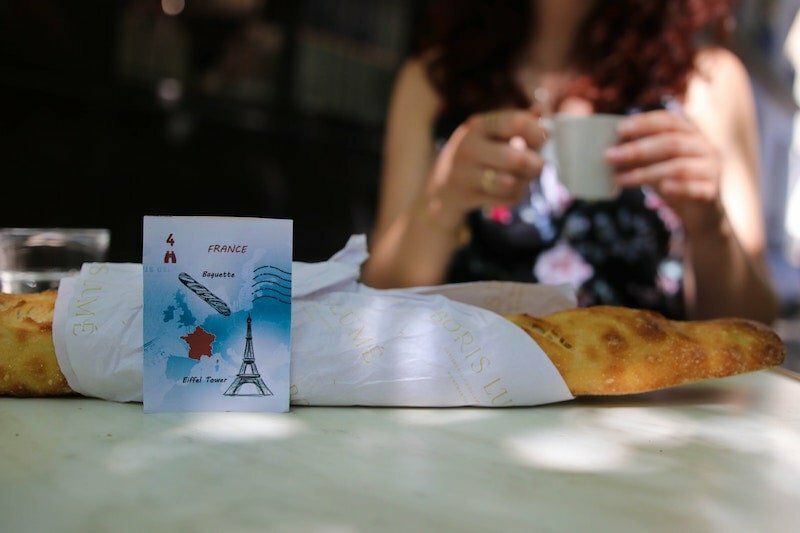 Each year there is the Best Baguette in Paris contest, and the list of the top 10 baguettes becomes a culinary pilgrimage route for foodies throughout the city. My favorite? 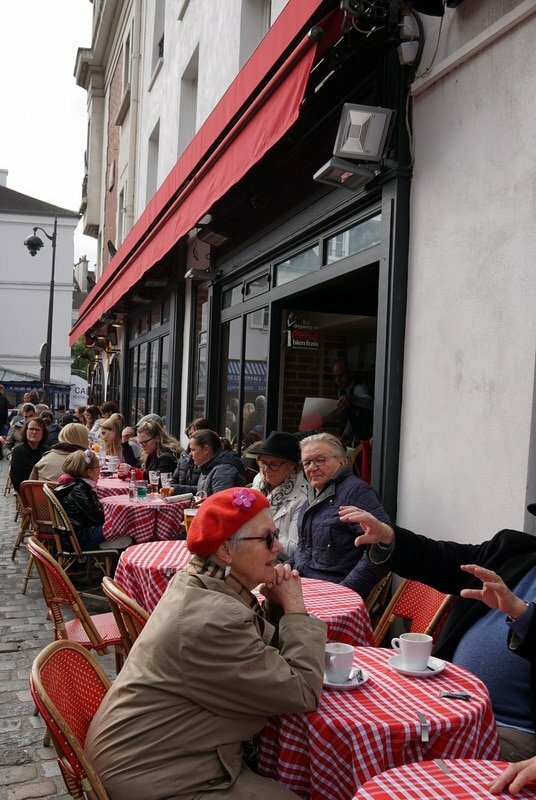 We went for the Grenier à Pain in the Montmartre neighborhood — a two-time first place winner! Delicious baguettes in Paris are a daily occurrence. Is there such a thing as the perfect croissant? I’d say so– and it’s definitely found in Paris! 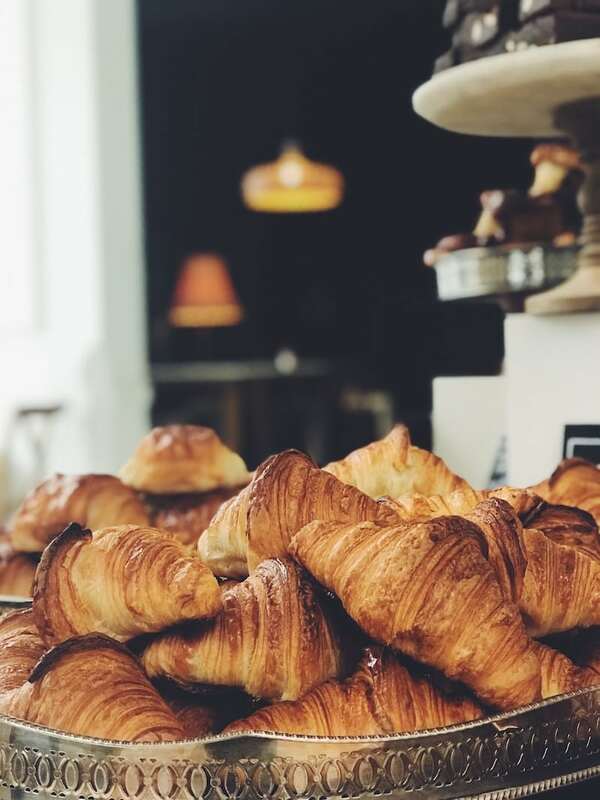 I ate my weight in croissants during our visit, learning early on that I preferred the croissant au beurre — a slightly more expensive croissant made with extra amazing French butter. My favorite croissant from our trip was at Boulangerie au 140 in the Belleville neighborhood. There are plenty of specialty macaron shops around Paris, each one more cute and colorful than the next! The flavors on offer are incredible– from classics like salted caramel to modern combinations like rosewater and raspberry. I realized the appeal of the macaron is its perfection — when done well these tiny bites are beautiful and pack a serious punch of flavor. They are a luxurious little bite, and perfectly representative of Paris. Colorful and flavorful macarons in Paris. 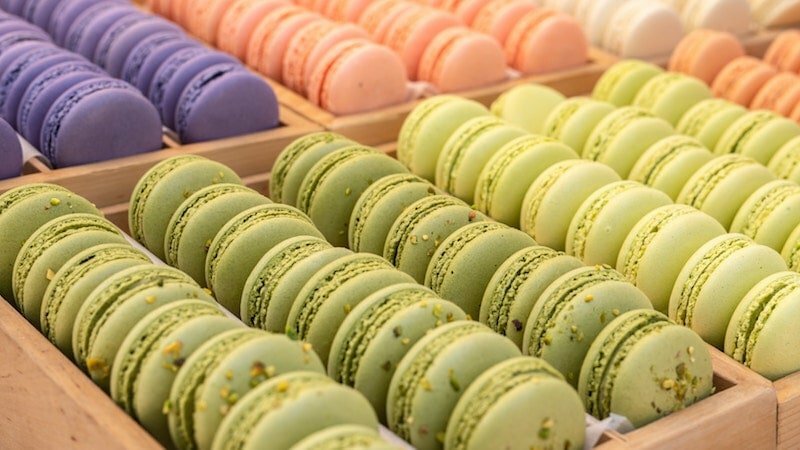 Here are some of the best macarons in Paris (life goal: try them all!). Okay — one more baked good and I’ll move on to savory– promise! 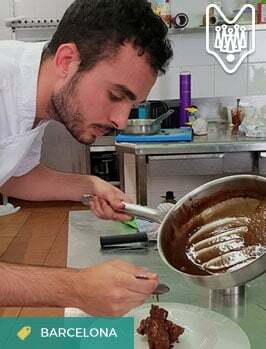 The eclair is another pastry that has not always fared well when exported, although in recent years trendy eclair shops have opened in big cities around the world. But my childhood memories of “eclairs” are very mediocre monstrosities from the local donut shop. I knew there was something better to be found. I had faith that the eclairs in Paris would be worth the trip alone — and I was right! In spite of the decadent nature of a cream filled eclair, I find these pastries almost impossibly light (and could probably eat half a dozen). 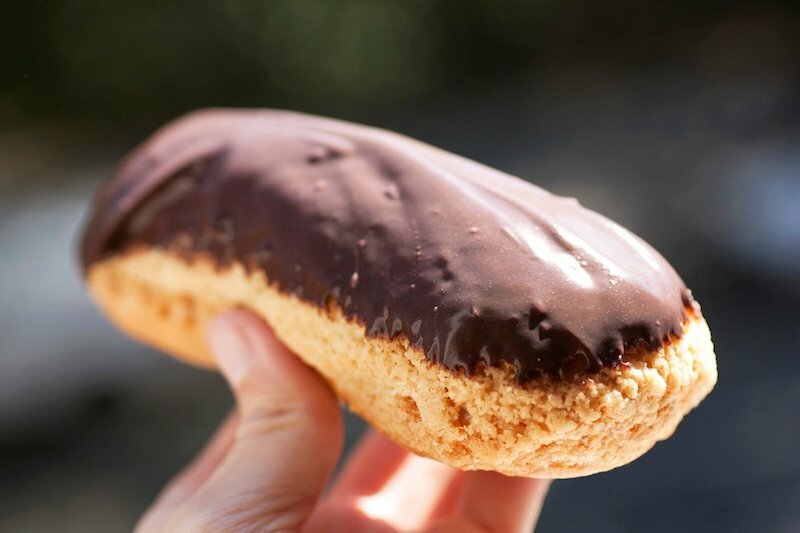 The classic eclair. Photo by bionicgrrrl on flickr CC. I wish I could be more specific with this recommendation, but there are too many incredible French cheeses to suggest trying one over another! See a long list here. Of course, comté and camembert are hard to go wrong with, but I also tried some lesser known small producer cheeses that were out of this world. My advice is to make friends with the cheesemonger near where you’re staying by purchasing per their recommendation. I ate a lot of cheese on my visit to Paris, and could have done serious damage to my credit card had I not had a luggage limit on the way back. 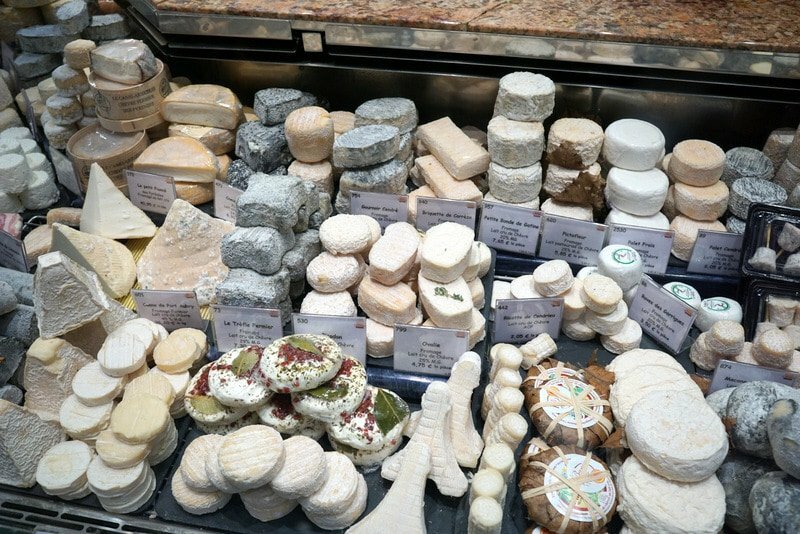 France has so many delicious cheeses to try! Some love them and others hate them, but I am definitely in the first camp. French oysters are renowned for their quality, and there are many different varieties from different parts of the French coastline. We tried Arcachon oysters (my favorites) and also Normandy oysters. While not the cheapest sampling of the trip, they were well worth the splurge and one of my top must try foods in Paris. 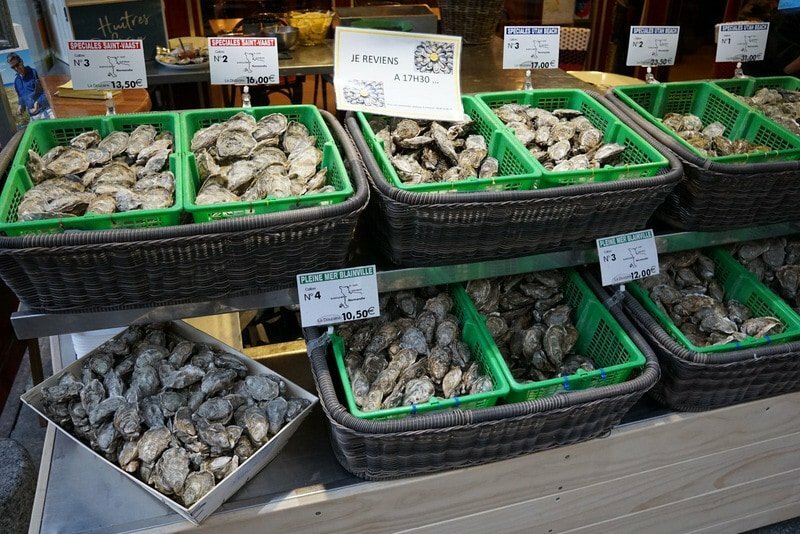 A variety of French oysters on offer. 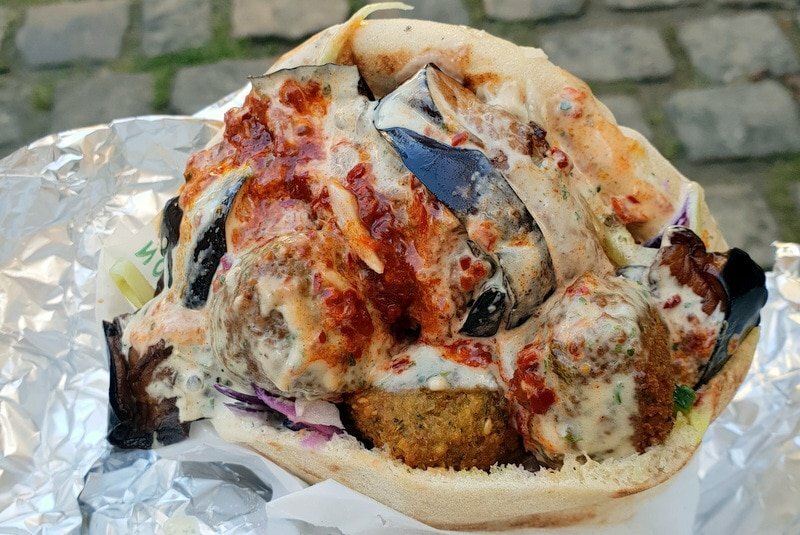 It may not fit in with everyone’s image of classic French food, but in today’s Paris, a falafel sandwich is just as Parisian as a ham sandwich! The most famous place in the city is called L’As du Fallafel, and the line often snakes around the block. We waited for about 20 minutes for our colossal sandwich and took it to a small park next door. I must say, it was delicious and worth the wait! Another popular Paris comfort food is couscous. In 2006, couscous was even voted Parisians favorite dish — beating out classics like beef bourguignon and cassoulet. Due to the many North African immigrants in Paris, there are lots of couscous restaurants, each with its own regional variation. 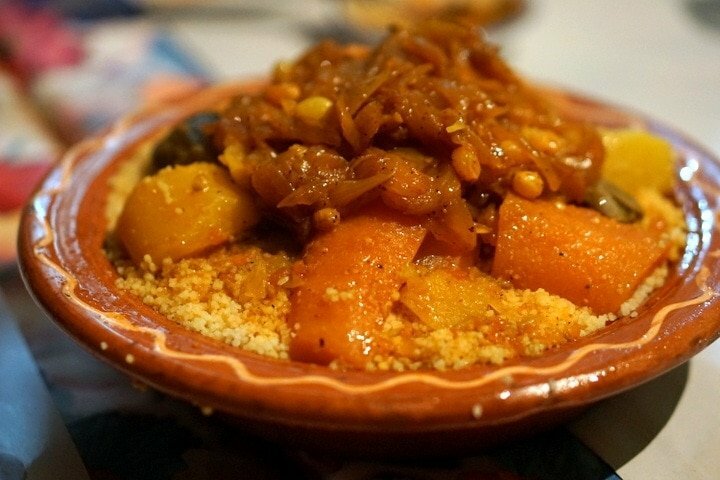 Check out some of the most popular couscous restaurants in Paris with this list. Delicious couscous is surprisingly Parisian! I personally love a good steak now and again, so trying steak frites in Paris was a must. Everyone recommends Le Relais de l’Entrecôte, a classic eatery with various locations around town. 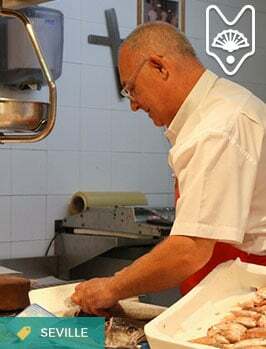 This is a place where they do one thing well, and while the quality isn’t a 10/10, it’s a place you visit first and foremost for the experience. 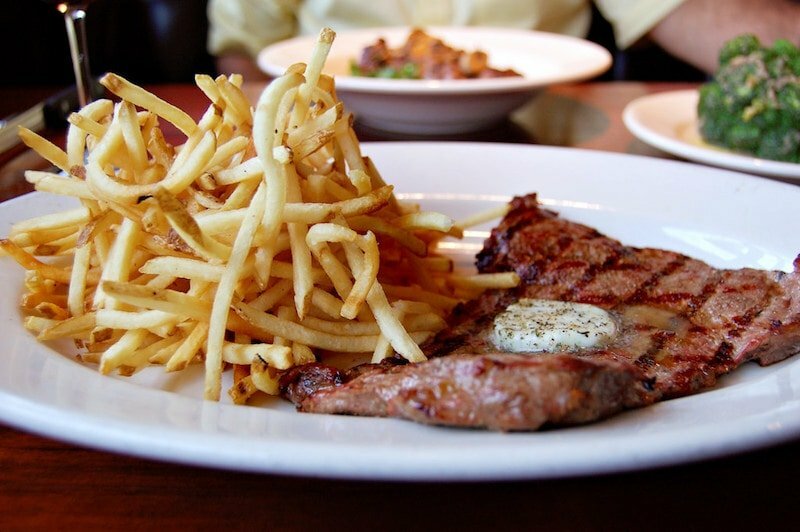 The perfect steak frites. Photo by Vivian on flickr CC. For something special (something I’d rarely attempt making at home and can’t find easily at restaurants in Madrid) I wanted to taste a good duck confit. This classic French dish is made by salt curing the duck (covering it with salt and herbs for a couple of days in the refrigerator) and then slowly cooking it in its own fat until incredibly tender. 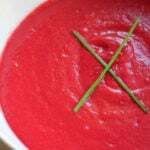 The flavorful result is then often jarred to last a few months. Unfortunately, a good duck confit is not all that easy to find in Paris, given the hard work involved in its preparation. Josephine Chez Dumonet is said to be good, though I can’t speak from personal experience. 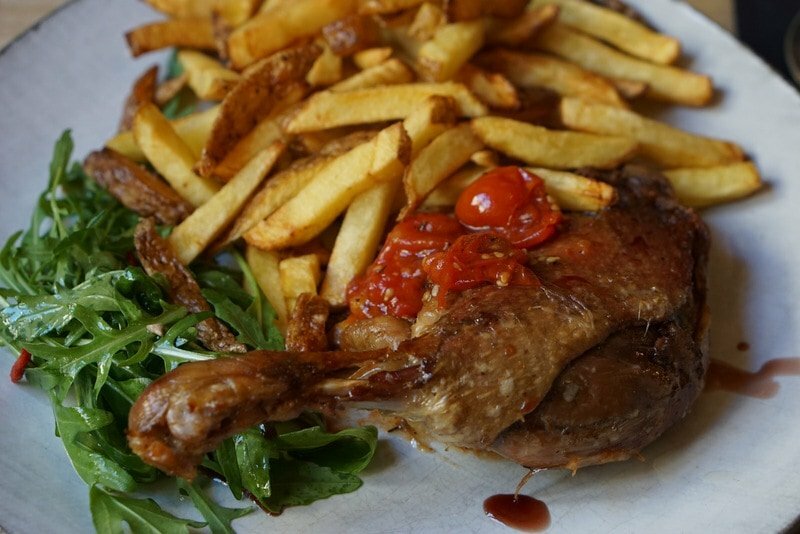 If you dare to try to make duck confit at home, here’s a traditional recipe. Back to the sweet stuff– chocolat. Paris is famous for its chocolate shops (many of which reminded me more of a luxury shoe store than a foodie mecca). 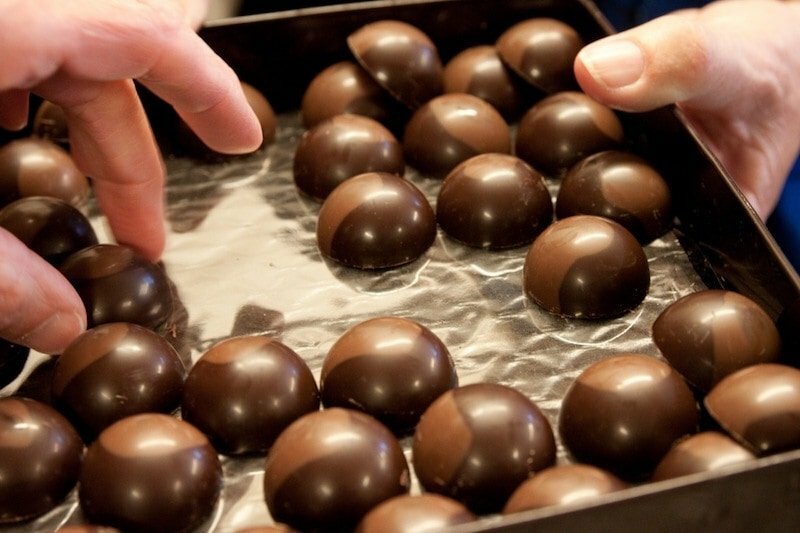 But that’s okay– because the chocolates they are selling are not your average indulgence. The chocolates I tasted in Paris were on a whole other level. My favorites were by Patrick Roger, a master chocolatier whose creations are truly special. At the top of my list for next time is Richart — another famed chocolatier known for quirky flavors. Incredible chocolates in Paris. Photo by Edward Kimber on flickr CC. I discovered French salted butter caramels at Henri Le Roux and may never be the same again (the chocolates here were also great). Brought to fame by Henri in Britanny in 1980, they now offer the classics and also a variety of special flavors. Try the black sesame or the buckwheat. Read more about Henri le Roux on David Lebovitz’s incredible blog. These are my top 12 must try foods in Paris – though I am sure that over my next visits I’ll have plenty more to add! I will probably have to do a follow-up post of pastries alone. 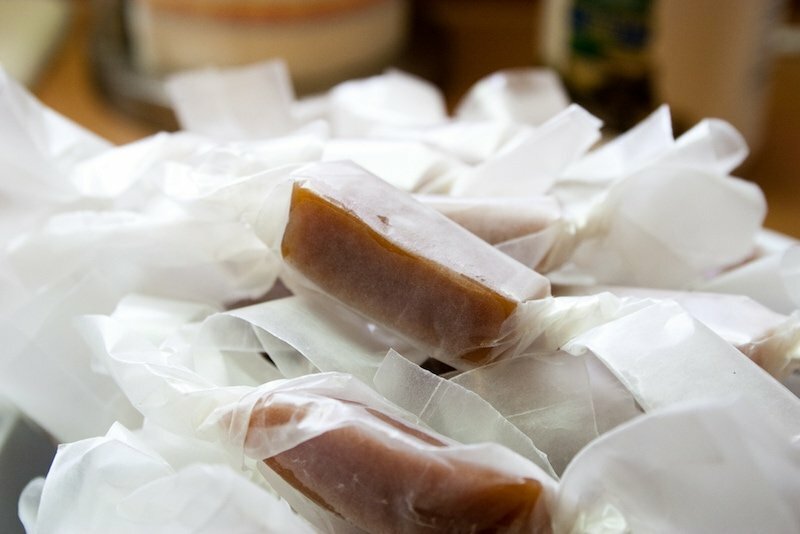 Amazing salted butter caramels. Photo by clutterandkindle on flickr CC. What do you think? Have you visited Paris? 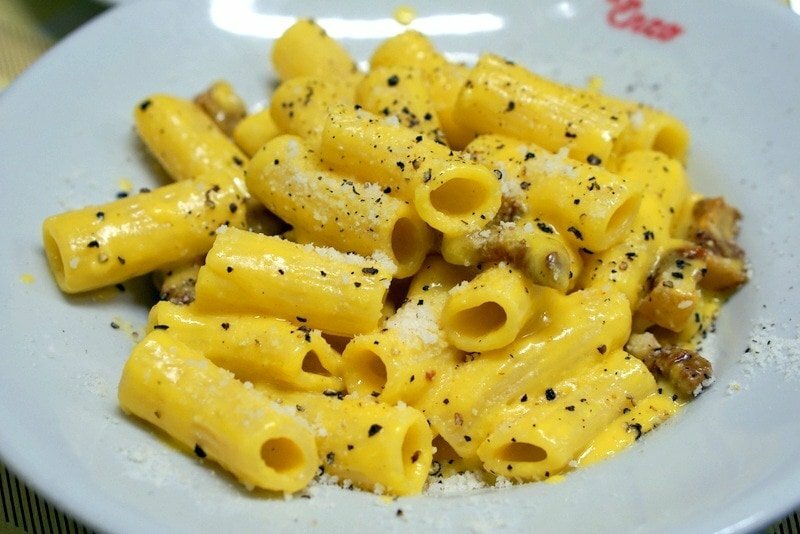 Any must try foods in Paris you think I’ve missed?